Oscar Scherer State Park, Florida - August 16 1973, Sharon Holmes, 16, killed at dusk by an 11'3" male alligator that had been fed by park visitors. Peace River Canal, Florida - September 29 1977, George Leonard, 52 was attacked and killed by a 7' female alligator while swimming at about 8:30 pm. Martin County, Florida - September 10 1978, 14 year old Phillip Rastrelli was attacked and killed by an 11 foot male alligator while swimming in Hidden River Canal at 12:00 pm. St. Lucie County, Florida - August 6th 1984, 11 year old Robert Crespo was attacked and killed by 12'4" alligator while swimming at 4:30 pm. Wakulla River, Florida - July 13th 1987 George Cummings III, 29 was killed by a an 11 foot male alligator while snorkeling at about 2:00 pm. Charlotte County, Florida - On July 4th 1988, a 4 year old girl Erin Glover was killed by a 10'7" male alligator as she walked along the shore of Hidden Lake at 6:00 pm. Martin County, Florida - June 19th 1993, Bradley Weidenhamer a 10 year old male was killed an 11'4" alligator while wading in the Loxahatchee River in Jonathan Dickinson State Park at 6:00 in the evening. Sumter County, Florida - October 3 1993, 70 year old Grace Eberhart was killed at Lake Serenity. Circumstances of her death are unknown except that she died of a broken neck caused by an alligator bite to the head and neck. Multiple alligators could have been involved in the attack. Volusia County, Florida - March 21st 1997, 3 year old Adam Binford was killed when he strayed outside of a roped off swimming area at Lake Ashby. His body was recovered the next about 1 mile from the attack site. An 11 foot alligator suspected of the attack was later killed by a trapper. Sarasota County, Florida - May 4th 2001, 70 year old Samuel Wetmore's body discovered in pond near his home with 8'4" alligator was circling nearby. Mr. Wetmore died of blood loss and trauma. Polk County, Florida - June 23 2001, 2 year old Alexandria Murphy wondered away from her fenced back yard and was killed by a 6'6" alligator 700 feet from her home on Lake Cannon. Sanibel, Florida - September 11th 2001, 82 year old Robert Steele was attacked and killed while walking his dog on a trail between two wetland areas in the J.N. "Ding" Darling National Wildlife Refuge. FWC officers later killed a 10'9" and 6' alligator. Lake County, Florida - June 18th 2003, 12 year old Brian Griffin was attacked while swimming near a boat ramp on the Dead River. The alligator was 10'4" long 339 pounds and was subsequently destroyed along with several other large gators. 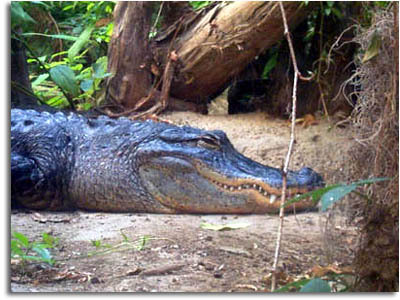 Sanibel Island, Florida - June 2004, 54 year old Janie Melsek was attacked and killed by a 12 foot long, 457 pound alligator, while working on landscaping. Lakeland, Florida - March 15th 2005, fishermen discovered the body of 56 year old Don Owen about 12 miles from his home, he had been missing since March 9th. Trappers later caught an 8'9" 300 pound alligator that had Mr. Owens forearm in it's stomach. It was later determined that the alligator had been fed by area residents which is illegal. Port Charlotte, Florida - July 15 2005, Kevin Albert Murray, 41, was swimming in the Apollo Waterway when a 12-foot alligator attacked and killed him. Sunrise Florida - May 10, 2006 Yovy Suarez Jimenez, 28, went out for an evening jog and was last seen dangling her feet over the water of a canal near her home. Her partially consumed body was found in the canal the following morning.